Based in Atlanta, Valerie Liles has been writing about landscape and garden design since 1980. As a registered respiratory therapist, she also has experience in family health, nutrition and pediatric and adult asthma managment. Liles holds a Bachelor of Arts in journalism from Colorado State University and a Master of Science in technical communication from the University of Colorado. Shedd’s Spread Country Crock is a line of products used to replace butter and margarine. However, before buying one of these products, here is a lesson in dietary fats. When choosing fats, pick unsaturated, such as polyunsaturated and monounsaturated, over saturated and trans fat. Unsaturated fats can actually reduce your risk of cardiovascular disease when used as a substitute for saturated fats and when used in moderation. Shedd’s Spread Country Crock comes in Original, Light, Churn Style, Calcium Plus Vitamin D, Honey Spread, Spreadable Butter and Original in a squeeze container. One serving of Original Shedd’s Spread Country Crock spread equals one tbsp. or 4 g with each container holding 90 servings. One serving of Country Crock Original costs you 70 calories, all of which come from fat. The total fat content is 7 g. Each tbsp. has 2 g of saturated fat, no trans fat, 4 g of polyunsaturated fat and 1 g of monounsaturated fat. Keep in mind that many foods, including spreads and sauces, contain different kinds and amounts of fat. For example, canola oil has more monounsaturated fat than butter, but it also contains smaller amounts of polyunsaturated and saturated fats. 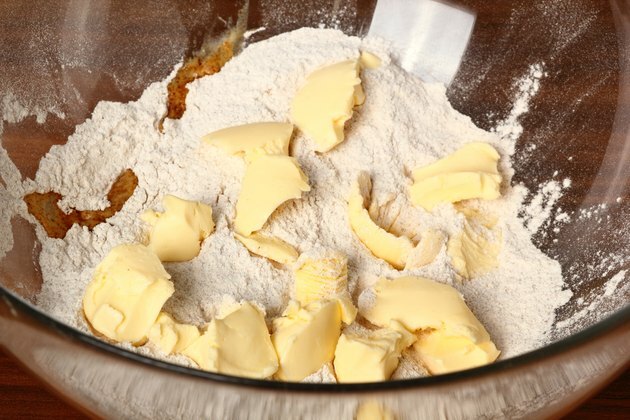 Butter contains unsaturated fats, but most of the fat in butter is saturated, which is not a healthy fat. Country Crock spreads contain no cholesterol, carbohydrates, dietary fiber, sugars and no protein. Country Crock Original has 100 mg of sodium per tbsp. Country Crock Spreadable Butter with Canola Oil has one-half the saturated fat and cholesterol of real butter. Not a significant source of vitamins or minerals, Country Crock Original provides only 10 percent daily value of vitamin A and 15 percent daily value of vitamin D. The Country Crock Honey Spread provides 10 percent daily value of vitamin A, vitamin E and calcium and 20 percent of vitamin D. Country Crock Spreadable Butter with Canola Oil only provides 8 percent daily value of vitamin A. Country Crock spread contains a vegetable oil blend of liquid soybean oil, partially hydrogenated soybean oil and hydrogenated cottonseed oil, water, whey, salt, vegetable mono- and diglycerides, soy lecithin, potassium sorbate, calcium disodium-preservative, citric acid, artificial flavor, vitamin A and beta carotene for color.